Greece is the 10th largest global tourism destination among OECD countries, based on the number of international tourist arrivals in 2016, according to the Organization's report "Tourism Trends and Policies 2018". In 2015, Greece attracted 28 million tourists in 2016, 7.5% more than 2015. Overnight stays amounted to 193.4 million, 2.9% more than in 2015. Cruise passengers remained stable at 5.1 million. 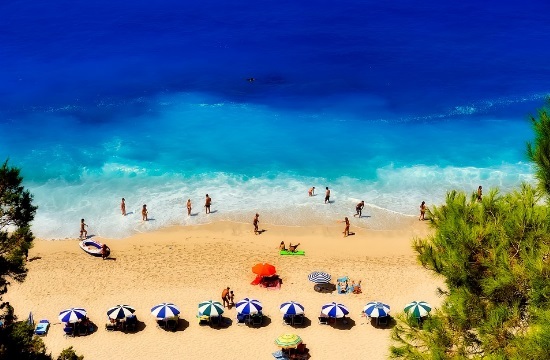 The report notes that tourism's gross added value to Greece in 2016 amounted to 9.6 billion euros, representing 6.4% of the national gross added value and supporting 366,000 jobs, that is 1 in 10 jobs in the country. 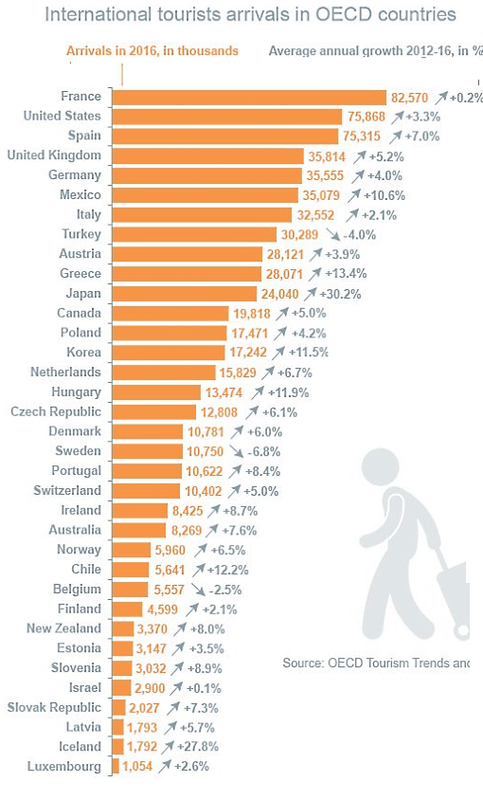 In calculating the direct contribution of tourism to each country, the contribution of tourism to national GDP exceeds the average of OECD countries (4,2%), while its contribution to employment in Greece climbs at 10%, which is the fourth best performance among all countries, after Iceland, Spain and Ireland. Employment in tourism records a progressive increase between 2012 and 2016 as 365,892 employees work in the hospitality sector, 72,238 employees in restaurants, 261,484 in transport, 3,921 in vehicle rental, and 20,872 in travel agencies. The budget of the Ministry of Tourism in 2016 amounted to 49 million euros, 26 million of which came from the regular budget (10 million euros from state resources) for promotional actions and 13 million from European co-financing for infrastructure, innovation, projects, skills and support for SMEs. .
Former Greek Tourism Confederation (SETE) President Andreas Andreadis, commenting on the OECD's report on his Twitter account, said: "Greece is the 10th largest global tourist power among OECD countries, only a breath away from 9th Austria, undoubtedly a huge national success of the country's tourist community." The OECD Tourism Trends and Policies 2018 publication was launched at ITB Berlin at a policy Workshop which brought together high-level policy makers and industry decision makers to discuss key trends and policy priorities emerging from the report, with a particular focus on megatrends likely to shape the future of tourism.